A few years ago my wife attended a Papier Mâché (paper pulp) art class. She taught the rest of us one technique called layering. In this technique you glue small pieces of paper inside or outside a mold in layers. You can glue a few layers at a time, let it dry, and add more layers. At the end you can leave it as is, paint it, and/or lacquer it. Once you have more than about 7 layers, the object becomes quite stiff and strong. At that time I made a nice pen holder using a food container as a mold using this technique, and that was it. But I kept wondering whether the technique could be used to make enclosures for electronic projects. A few weeks ago I decided to give it a try and to build an enclosure for the Softrock Ensemble II RX. You can see the result in the picture above. I did not have a plastic box with the correct dimensions to serve as a mold, so I decided to start with a skeleton box made out of thin corrugated cardboard. 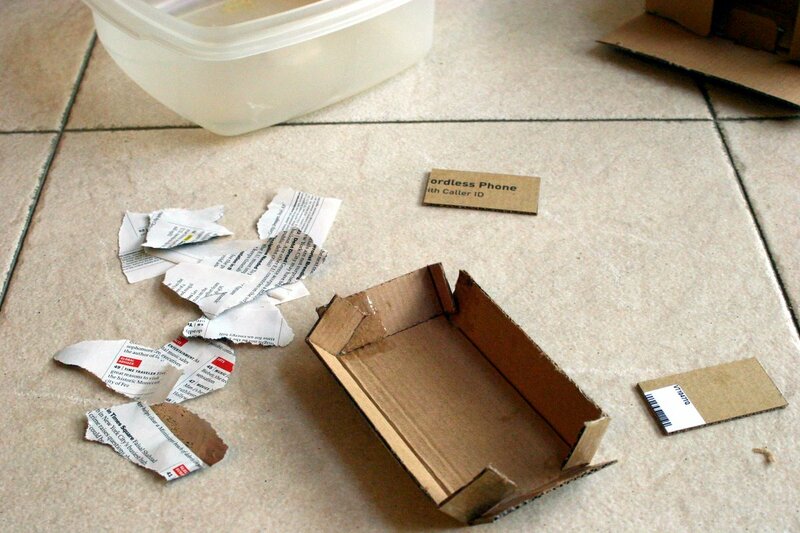 I cut the skeleton out of a packaging box, which you can see in the picture on the right. I designed the size to fit the receiver and glued the sides using flaps that I left on the sides of the box. I left the top open. 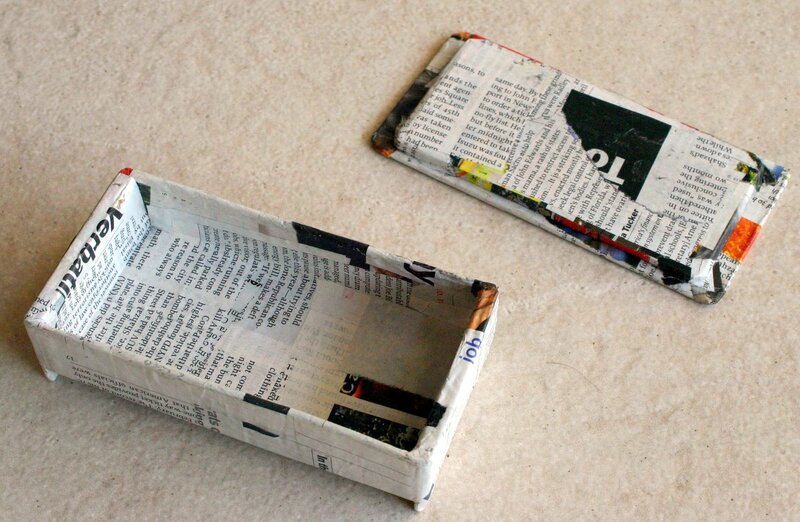 On the sides, I glued rectangles of the same material that extend below the bottom of the box, to serve as feet. I left the top open and made a lid our of two rectangles of cardboard, one to fit over the box and a smaller one that would fit into the box, so that the lid does not move. You can see the cardboard that I used for the skeleton on the right, along with some pieces of magazine paper that I used later in the layering process. I didn’t count the number of layers I glued on the skeleton. I just kept going, letting the box dry once in a while, until it felt stiff enough. The corrugated cardboard skeleton is pretty soft, so it took quite a few layers to get the box to be stiff. I used regular PVA glue (white glue), diluted with water. In the picture on the right you can see the box and lid almost ready. I used pages out of a magazine for the layering. At that point, I switched to white printer paper, to get a white box. When the white paper covered the box, I made the holes for the mounting screws and for the connectors. I started with small holes made with a hand drilled, and then enlarged them as necessary with larger drills, a hobby knife, and a round file. The strength of the material is similar to that of soft wood, so it’s not hard to shape the holes. Once the holes were made, I glued thin strips of paper through them (part of the strip on the outside of the box and part on the inside) to stiffen them. I then glued another sheet of paper on the front. That’s it. It took many hours to make the box. As you can see in the pictures below, the enclosure does not look mass produced (indeed it was hand made). Whether you think that this is a good thing or a bad thing is a matter of taste. I like it. Here it is with the lid open. I didn’t find a good way to make the lid latch closed. 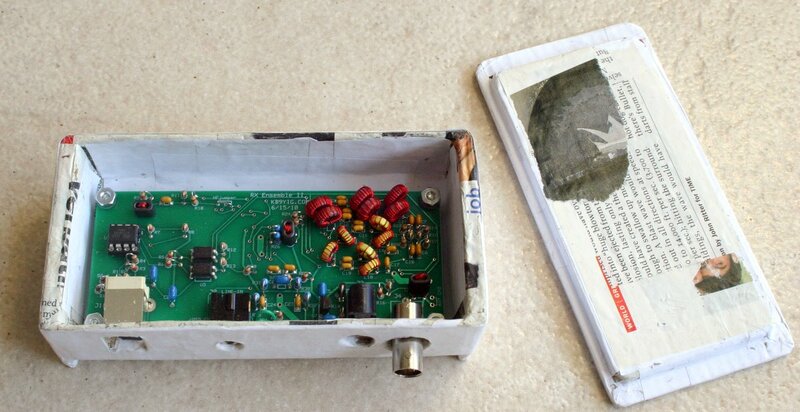 I can always glue a piece of paper covering both the lid and the bottom part, but as long as I want to tinker with the receiver, I’ll keep the lid separate. Even once glued, it should be easy to separate the top with a hobby knife if I need to. Thanks to Alan Reeves’ good advice, I was able to get the two USB sound cards working at the same time on the same Windows XP computer, something I did not manage to do up to now. Alan is using the same cards I am using, but because he uses them with the Microsoft driver that is built into Windows XP, he is able to use two identical cards simultaneously. I, on the other hand, was using the Creative driver (Creative is the sound cards’ vendor). Once I manged to remove the Creative driver (this was very hard; more on that in another post), I inserted the card and Windows reported that it detected a new Hardware. I allowed Windows to install the driver automatically and indeed the installed driver was Microsoft’s, not Creative’s. I inserted the second card. Windows did not report a problem. I fired up two instances of WSPR, told each one to use a different card, and that was basically it. Actually, it was not quite as simple. For reasons that I still don’t understand, initially only one instance of WSPR would actually receive audio. The other instance behaved normally, but it didn’t see any audio. 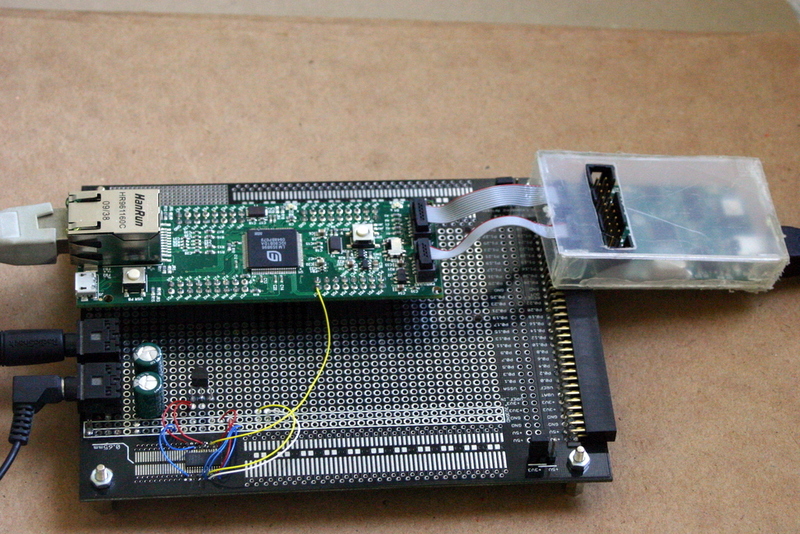 I think that the key was to start both instances after both cards were inserted and working. In any case, eventually everything worked and I was spotting stations on two different bands at the same time using two Softrock receivers (the 7MHz Lite II and the Ensemble II RX) and one computer. It ran fine all night, producing more than 600 spots on 3.5MHz, 7MHz, and 10Mhz. Very satisfying. Once I figured out how to use my crystal-controlled Softrock under WSPR, it seemed a shame to use only one receiver at a time. I should be able to use the 7MHz Softrock to monitor that band and the Softrock Ensemble II RX to monitor the other bands. The easy part turned out to be feeding the two receivers. I built an antenna splitter designed by Dave Johnson and published on Todd Gale’s web site. It’s a simple device with two toroid transformers and one resistor. I didn’t measure it’s performance, but it works. The audio from the two Softrock receivers is routed to two separate USB sound cards. I tried to connect both of them to my laptop, running Windows XP. Only one sound card was usable; the other did not show up on the audio menus and it shows up as not working in the Device Manager. I guess that the Creative device driver for the card can only cope with one card being connected to the PC. I then tried to connect at least one of the cards to Linux running under VirtualBox on the same laptop. Linux saw the card but WSPR failed when trying to read audio from it. I gave up and connected the two cards to two different computers. This obviously worked fine. I ran the setup all night. 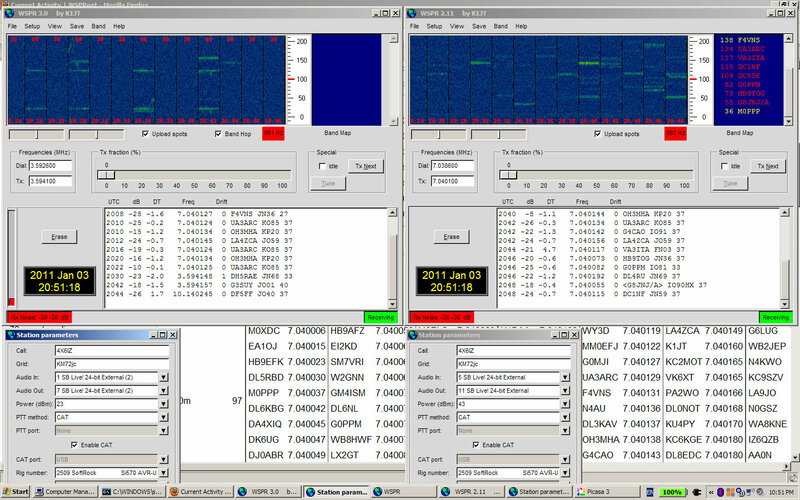 The 7MHz receiver generated more than 900 spots (more than usual, which is around 500; could be better proparation or more people transmitting). The Ensemble II RX was initially hopping between 5MHz and 10MHz. This generated my first-ever 5MHz spot, of a station in the UK. After a couple of hours I switched it to hop between 3.5MHz and 10Mhz. This generated two dozen spots at 3.5MHz (including my first 3.5MHz spot of a station in the US, more than 11,000km away) and more than 140 spots at 10Mhz. I still need to figure out how to do this with only one computer.